still remain. Outside of each capital there is a very worn mask built into the drum. 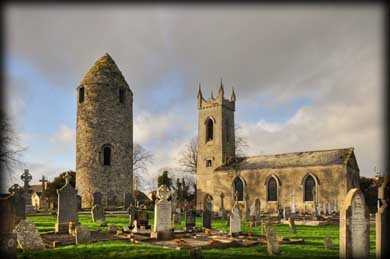 The monastery was plundered by both the Irish and Vikings in the 10th and 11th centuries. Also present at the site is a 10th century High Cross and the gable and foundation of a 13th century Church. 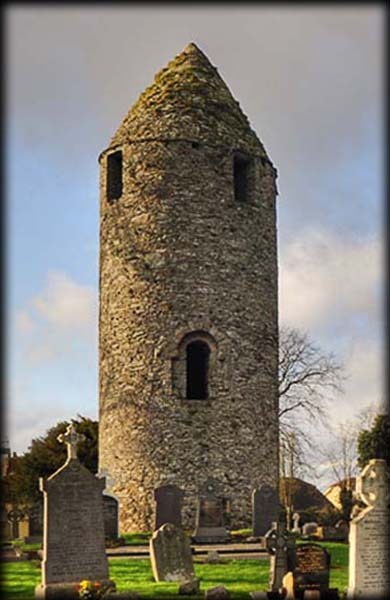 Situated: From Drogheda take the N1 North, through Castlebellingham. About 2 kms down take a left (sign-posted) for Dromiskin. The tower is on your right. Discovery Map 36: O 0522 9815. Last visit Jan 2012. Door: Above ground 3.7m. Type: Arched. Windows: Five, 4 Later belfry windows. 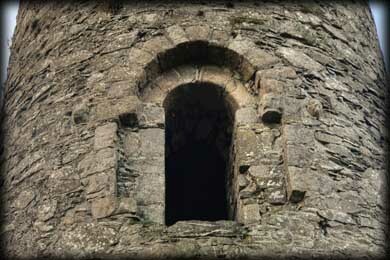 1 angled window.